So I'm currently in Malaysia. We had 3 days off at work for the Tomb Sweeping Festival (Monday-Wednesday of this week), and I figured I'd take off Thursday/Friday and just have a whole week off. Didn't go over remarkably well at the office, but eh, what can you do. I decided to go visit my friend Sabutai in KL again, as I was able to use my United Miles and fly there for essentially free (business class on Singapore Airlines, no less!) And as unnecessary as this trip may have been, I feel like to some extent I needed a vacation, as the Chinese custom regarding days off is that, because we had off Monday-Wednesday, we had to work the old 7-day work week prior. That is, we worked from Monday-Friday, then Saturday and Sunday. This 7-day work week totaled about 75 hours. So yeah, I figured a vacation was in order. 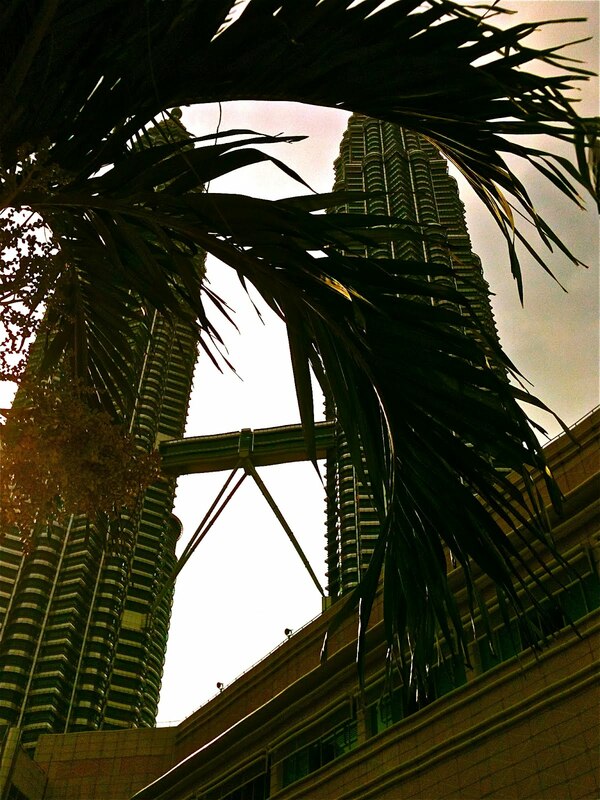 Kuala Lumpur, or as it's universally known throughout Asia, KL, is a city I've now been to three times. Each time that I've visited this teeming metropolis known as "Muddy Estuary" in Malay, one thing has always been very apparent--this is, without question, one of the most diverse cities on earth. Now to qualify this statement--I lived in Hong Kong for 5 months of my life, and I thought that it was a remarkably diverse city. You'd go to someplace like Tsim Sha Tsui and see people from everywhere. Indians, Pakistanis, Ghanians, Middle Easterners, Ivorians, and loads of backpackers from all over the western world. I've always told people that Chungking Mansions, a building block in TST, Hong Kong, is a sociologist's dream, that is, there are people from dozens (maybe 100+) countries in that building at any given time. It's staggering. However, when you compare Hong Kong as a whole to a place like Kuala Lumpur, it's not even close. Hong Kong, as diverse as it may be, is still about 90+% Chinese. Yeah, the ~10% that aren't Chinese come from everywhere, but make absolutely no mistake about it--Hong Kong is a Chinese city (yes, it has a very western feel to it, but really, the city's demographics are strongly, strongly Chinese). Kuala Lumpur, on the other hand, is not. In short, KL is about 40% ethnic Malay, 40% ethnic Chinese, 10% Indian, and then 10% EVERYTHING (thus far I've met Burmese, Chinese, Mauritian, Malay, Pakistani, Indian, Bangladeshi, Singaporean, and probably several others that I don't even know). And even those two 40% groups have, it seems, a pretty decent amount of intermarrying--you'll see loads of Chinese people with hints of Malay to them, Malays with bits of Chinese, etc. And it's not just the people you see, it's the food, the signage, the architecture, everything is basically thrown into this giant melting pot that is one of Southeast Asia's most truly unique cities. This ethnic hodge-podge is most evident in areas of town like Central. I found myself there today walking from Little India to Chinatown. There was absolutely no indication that these two parts of town were separated, basically I just noticed that the percentage of signs in Hindi/Bengali/etc. was decreasing, while the percentage of signs in Chinese was increasing, and eventually I found that the street stalls filled with chicken tikka, samosas, and mango lassi were replaced by street stalls serving duck, egg tarts, and bubble tea. Really remarkable. Now for a brief bit of history on Kuala Lumpur. In a move fairly similar to my current hometown of Shenzhen, Kuala Lumpur did not exist 150 years ago, and today the whole metro area is about ~7.5 million. Very fast-growing city, for sure. Situated in the Klang Valley in the southern part of the Malay Peninsula, it is home to, among other things, former tallest buildings in the world the Petronas Twin Towers, the KL Tower, a vibrant Chinatown, and a host of other fairly interesting things. Actually, that's really not true about the host of other interesting things--as nice as KL is, it lacks a lot to actually do (similar to Shenzhen, as it were). However, it does (again, similarly to Shenzhen) have a reputation as a shopper's paradise. Hell, the activity of shopping in KL has its very own Wikipedia page. KL also happens to have one of the most insane airports I've ever been to. Another fairly interesting thing I found out about Malaysia since I've been here this time around--apparently their legal system stipulates that if you are a Muslim and you commit a crime, you are punished for that crime based on Sharia (Islamic) Law. For those who are non-Muslim, if you commit a crime, you are charged with Common Law, with their Common Law legal system being heavily influenced by their former colonizers, the British. Furthermore, despite the fact that the state religion is officially Islam, you are guaranteed absolute religious freedom. I read a really, really interesting National Geographic article about 2 years ago, written about the more moderate brand of Islam being practiced currently in Indonesia. Having been to both Indonesia and Malaysia, and having had a decent bit of exposure to the mindset of both places, it definitely seems like Malaysia's Islamic fervor is quite a bit less than that of Indonesia. But anyway, interesting stuff. I had a fairly bizarre experience today--I was in Suria KLCC, a huge shopping complex in central KL, and needed to use the bathroom. There was a 2 ringgitt (about $0.66) "VIP bathroom" that was nearest to me, so I figured, eh, and paid the 2 ringgitt to use it. Remarkable. As I went to wash my hands, the bathroom attendant took my hands, put them under the soap dispenser, pushed the soap dispense button, put my hands under the tap, as I was washing my hands he got some towels, dried my hands, removed my glasses (this was getting slightly awkward), cleaned them for me, and while doing so, gave me a damp cloth to press against my face. He also started chatting with me in pretty near-perfect English, "so how are you boss? enjoying your time here in KL? ", etc. Oh, and to top it all off, he sprayed me with some cologne as I was about to walk out! I felt like the 3 ringgitt ($1) tip I gave him was immensely insufficient, but he seemed appreciative enough about it. Anyway! Other stories from Kuala Lumpur--my friend Sabutai from exchange in Hong Kong is currently living here, so I'm staying at his flat near International Medical University, where he is going to med school. As it turns out, KL has a disproportionately large population of Mauritians--those from the island of Mauritius, a small country of ~1.3 million off the coast of east Africa. Consequently, many of Sabutai's friends from university are Mauritians, and I must say, their language, Mauritian Creole (similarish to French) is one of the more remarkably cool-sounding languages I've ever heard. Not entirely sure why, but just very pleasing to the ear. As it turns out, the high-speed train from KL Int'l Airport into the city has free wifi throughout the entire train. This is a technology that I know does not exist in Hong Kong on their Airport Express train, does not exist in Shanghai on their Maglev, does not exist in SZ on the metro from the airport, and yet here, in good old Kuala Lumpur, we have free wifi on the train from the airport. Remarkable. Last night we went to an Arabic restaurant. For a meal, 2 lemon teas, and my share of the shisha (a Middle-Eastern water pipe with flavored tobacco), it cost about $5US. What a country. Back in South China on Saturday evening, Guangzhou for the Canton Fair in like a week, then Vegas in about 3 weeks. More updates to come (hopefully more consistently) as they develop, cheers for reading this far.